Construction Materials, Lumber | Hughes Springs, TX - Trico Lumber Co.
A lot more than just studs! You Can Count on Trico Lumber Co.
From simple projects around your home to major construction, such as a new home build, you can rely on Trico Lumber Co. to supply high-quality materials at affordable prices. With decades in the industry, our family business offers our services and products at three different locations in the Northeast Texas area. We're also authorized dealers and servicers of STIHL® power equipment. Rely on our great selection and knowledgeable staff when you need to get the job done right, on time, and within your budget. We're a family-owned-and-operated business that has been serving our community for over 35 years. Our owners, Kyle and Rebbecca Morgan, and their family have been in the area for generations, and we've been supporting and supplying the construction and lumber industry for decades. With locations in Linden, Jefferson, and Hughes Springs, Texas, we're proud to be a part of your local community. Our friendly professionals are here to help you get your construction projects and honey-do lists complete. From lumber and building materials to STIHL power equipment, take advantage of our wide selection and decades of experience for projects large and small. 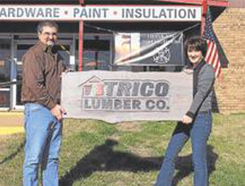 Learn More About Trico Lumber Co.